Joreels Casino Review -- 100% Deposit Match + 50 Extra Spins! Joreels Casino Review — 100% Deposit Match + 50 Extra Spins! Joreels casino offers mobile slots, casino games and cool bonuses to go with them! Claim £100 Plus 50 Extra Spins! Joreels is most certainly a slick and sophisticated mobile casino (if you can get past the fact they use a hideous font). Themed around a 1920s New York prohibition-era dive, the whole thing has a classic feel about it. The fact that this theme is rendered in well-illustrated cartoon drawings adds to this charm. However, can this international mobile casino do more to impress us than by using its good-looks? We'll have to see but we think, for the most part, it does. Here's why. 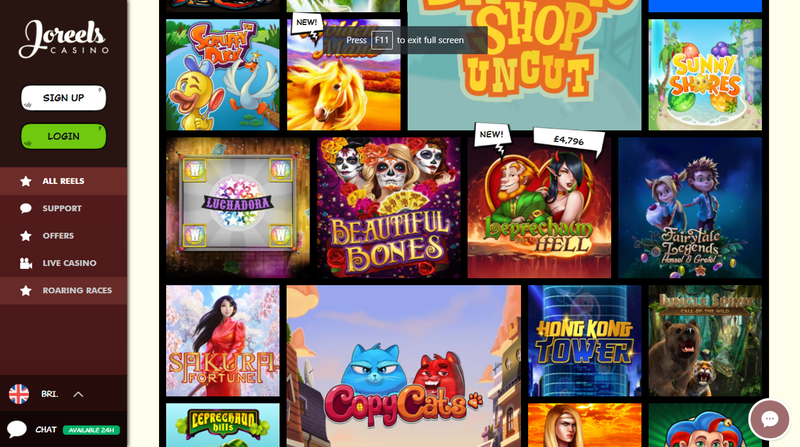 You've got over a hundred games to choose from at Joreels, because it has enlisted the content from many different developers such as NetEnt, Microgaming and Play ‘N GO. So, it has all the game stuff ticked off, but what about the promotional material? It gets that right too, we think. With plenty of extra spins and cash bonuses, it'll keep you entertained for a time. What else is good? Read on to find out! The games available at Joreels are certainly impressive. Of course, when you have Microgaming, NetEnt, Evolution Gaming, Betsoft, NYX , Play ‘N GO, Quickspin, Yggdrasil Gaming and Thunderkick content, you will naturally have a lot to choose from. Not only that, but you'll have a lot of great content from which you can make your choice. Peruse all of Joreels slots at your leisure by selecting whichever developer suits your fancy. Or choose from a selection of the more popular slots on the site. The decision is entirely yours and you have literally over a hundred choices to make. There are even jackpots that you can enjoy! As well as slots, Joreels offers table games for players such as roulette and blackjack. All games work effortlessly on mobile as well as desktop so both player types (at home and out and about) can enjoy the game content at Joreels. Sadly, while the four bonus and promotions schemes at Joreels are quite generous, we feel that there's a lot to be desired. For instance, the higher wagering requirement of 49x is quite unreasonable, in our eyes. Many players don't have a hope of reaching that amount, so it's quite harsh to expect them to. On the other hand, a £100 first deposit match bonus and 50 extra spins to use at your leisure isn't all bad. Neither is more extra spins at the weekend. 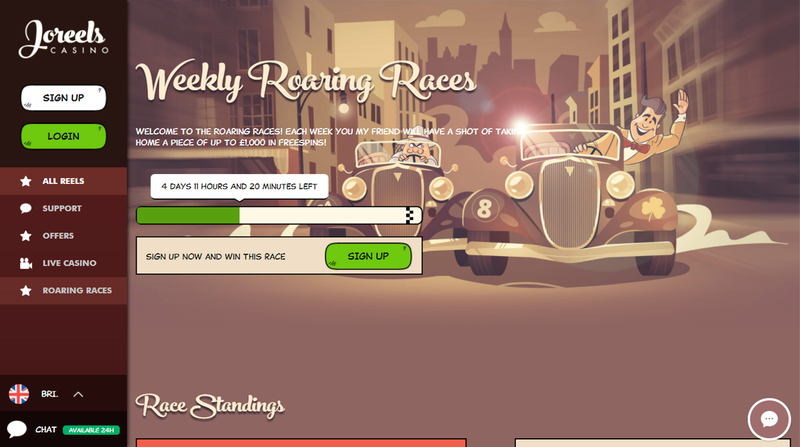 The biggest (and most unique) promotion scheme at Joreels, however, has to be the weekly racing which involves a cash prize of £1,000 for players lucky enough to come out on top. Payment at Joreels is simple. You can deposit via Trustly, VISA debit/credit cards, Skrill, Neteller, Paysafecard or wire bank transfer. Almost all these options withdraw too, making the options varied and open for most players. The deposit minimum is about £10 a day while withdrawals are £20. Processing time for deposits are instantaneous while withdrawals can take a bit longer (between three to five days). However, this is rarely the case and usually takes a lot less time than that. Most of it is instant anyway. Customer service at Joreels are seriously lacking. Not only is there no helpline to contact, but there's no live chat function either, making any immediate problems that don't fall under their FAQ page unsolvable. Players need a more direct line of communication if they were to seek help about complex issues. Not everything can be solved through an FAQ page. Want to play at Joreels? Joreels is a slick, stylish casino that oozes sophistication! Claim £100 + 50 extra spins now! Joreels Casino Overall, Joreels casino does some things well, like having good gaming content and some neat prizes but it does other things quite wrong for it to be a success. The absurd wagering requirement is unreasonable, to say the least, and the lack of any basic customer service options leaves much to be desired. Also, Comic Sans. There's too much of it. Joreels can do with less of that.